Take a look at these top stories from the past week in your Sunday Paper! Work, work, work is all that has been going through our heads since Rihanna’s ‘ANTI’ album was dropped. The song that features the island gal and Drake could possibly be this year’s song of the summer. This isn’t the first time the pair had teamed up for a collaboration. Rihanna was featured on Drake’s ‘Take Care’ single back in 2011 after rumors of them dating swirled. The two have appeared to remain close in a professional relationship, but after seeing Rihanna’s video teaser for ‘Work’, we all have to wonder if they are rekindling things. The pair get real close and personal dancing to the reggae beat and Rihanna and her squad do some serious twerking. We can only imagine that the entire video is just a hot! Sia recently picked up a ride with the British comedian James Corden and it was nothing short of spectacular and haunting. Dressed in her signature cropped bang hair and oversized bow, the ‘Cheap Thrills’ singer belts some of our favorite tunes like ‘Elastic Heart,’ ‘Chandelier,’ and ‘Diamonds’. Sia’s latest album ‘This is Acting’ is a compilation of songs written for other artist, such as Adele and Rihanna, that didn’t make their final projects. After the Grammy’s this past Monday and being dubbed ‘Baby Aguilera’, there is no question this girl can sing! 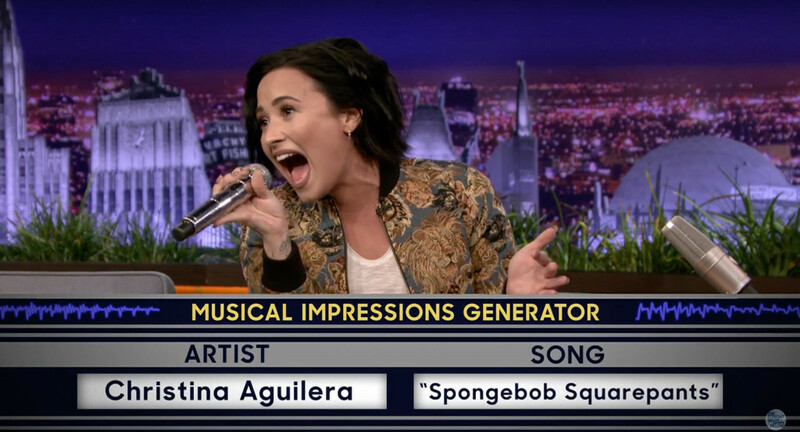 Demi Lovato recently appeared on NBC’S The Tonight Show with host Jimmy Fallon for his Wheel of Musical Impressions segment. Artists channel other artists while singing old tunes, nursery rhymes, show theme songs, and our favorite hits.